Polka Version: Heel-toe along LOD (1-2), turning polka (3-and-4), repeat opposite, followed by four turning polkas. Galop Version: Heel-toe along LOD (1-2), turning polka (3-and-4), repeat opposite, followed by two four-slide galops. Casting Version: Heel-toe along LOD (1-2), cast Follow from right arm to left arm with Reverse Polka footwork (3-and-4), repeat opposite, casting Follow from left arm to right arm with Polka footwork. 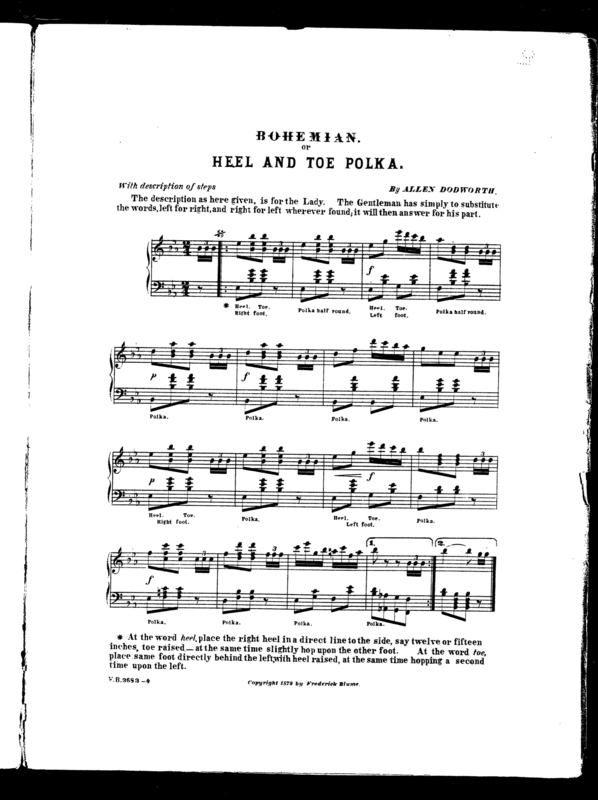 Long Polka Version: Heel-toe along LOD (1-2), polka x 3. For another version that repeats opposite, see the Combination Polka. 1 - Hop on the right leg (a little one) dropping your left heel close to the right toe. 2 - Repeat the little hop on the right, pointing your left toe close to the right heel. 3 - Again the little hop on the right leg, advancing one step forward with the left foot. Bring up the right foot, turn at the same time and pass your partner over to your left arm. (see figure 4). In repeating this, substitute the one foot for the other, and one arm for the other, in reading it, and the directions are explicit. With the heel and toe step Valse up and down passing your lady over from your left arm to your right & from your right to your left alternately. The description as here given, is for the lady. The gentleman has simply to substitute the words, left for right, and right for left wherever found; it will then answer for his part. Right foot: Heel. Toe. * Polka half round. Left foot: Heel. Toe. Polka half round. Polka. Polka. Polka. Polka. Right foot: Heel. Toe. Polka half round. Left foot: Heel. Toe. Polka half round. Polka. Polka. Polka. Polka. * At the word heel, place the right heel in a direct line to the side, say twelve or fifteen inches, toe raised—at the same time slightly hop on the other foot. At the word toe, place same foot directly behind the left, with heel raised, at the same time hopping a second time upon the left. First Part:—Hop on the right foot, and at the same time place the left foot to the side (2d), the heel upon the floor, the toe turned upward, 1; hop on the right, and at the same time place left behind (5th), the toe upon the floor, the heel raised, 2; one measure. Polka, one measure, 1, 2, 3. Repeat the above, making heel and toe with the right foot and following with the polka to the right; in all, four measures. 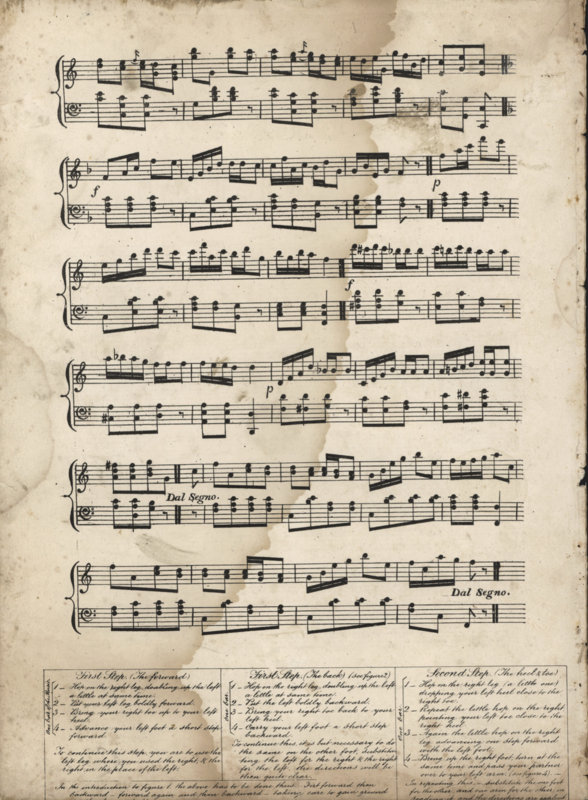 Second Part:—Glide Polka, four measures. Recommence at first part. For description see Bohemian Polka. At the count "heel" the foot is extended to the second position, but with the heel down and the toe raised, and at count "toe," the moving foot is moved to the fifth position, behind the stationary foot, or in other words, starting with left foot, the foot is extended to second position, heel down, and at count "toe," the left foot is moved to fifth position for right foot, except that the weight of the body rest on the right foot. In actual dancing these fifth positions are not conformed to strictly, and often the foot is extended to second position without putting the heel down, and while this leaves out one of the features whence the name of the dance is derived, it does not detract from the elegance of execution. 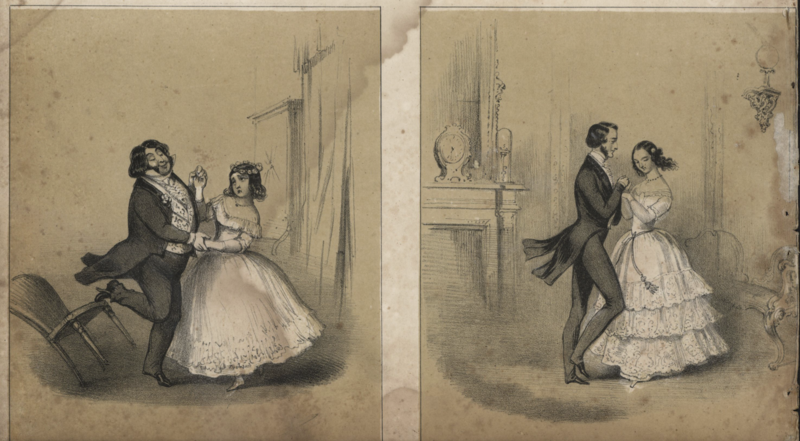 The lady dances the same steps except that the dance is commenced with the right foot. From time to time, slight differences in the style of the polka step are introduced for variety; a name is given the innovation, and after a temporary popularity it makes room for something newer. 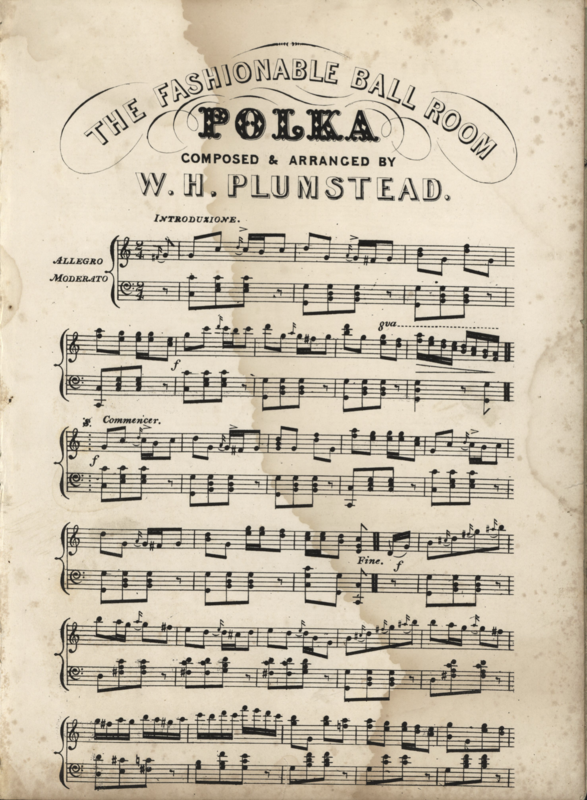 These inventions are so closely allied to the varieties of polka already described that they can be learned at short notice and without difficulty. First Step.—Place the left heel on the floor in the second position, resting on the right foot; count one. Bring the toe of the left foot behind the right; count two. Then take the full polka step; count one, two, three. Second Step.—Place the right heel on the floor, resting on left foot; count one. Bring the toe of the right foot behind the left; count two. Then take the full polka step, count one, two, three. Third and Fourth, Steps.—Then take three long galop slides with the left foot on accent, and as the right foot is brought up to the left foot for the third time, rest and raise the left foot slightly from the floor. Repeat by sliding with the right foot. The music is in 2/4 time.